To set or edit a channel's settings, do the following. (This assumes you have already logged into Media Space and are at the channel you wish to edit). 1. In the header bar for the channel, under the Media Space orange menu, you will see an icon with 3 horizontal bars. This is the control menu for the channel. 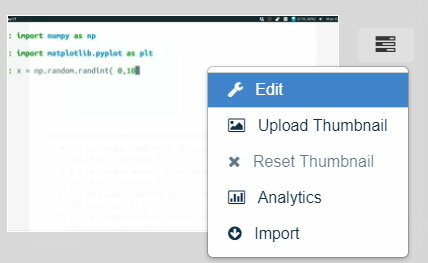 From this menu you can edit the settings and membership of the channel, set the thumbnail for the channel, and view analytics. We will only cover the channel settings here. 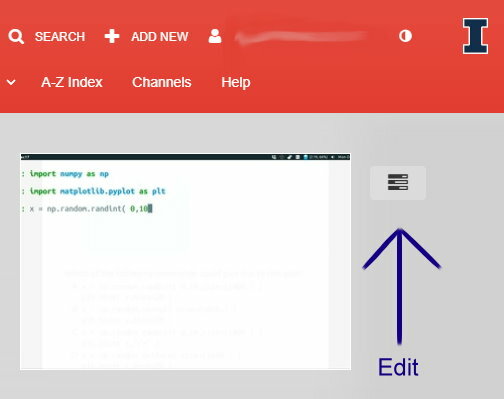 you can rename the channel and add additional description to make the channel easier to locate in a search. You can also include links to other locations in the description. A description is required. Private: only specifics netids can see the content and add to the channel. The ability to add media is based the Members setting below. (This is also very common, often for course channels) You can add the netids individually or contact the Kaltura admins to do bulk additions. Shared Repository: Very similar to Restricted channels. We don't recommend using this setting. Moderate content: the channel manager or moderator must approve all content from contributors. This can become tedious to approve all content, so consider the use case before selecting this. Keep comments private to channel: we recommend selecting this if media is in more than one channel. This keeps comments specific to the channel using the media. Enable subscription: this isn't very useful. A user doesn't receive notifications with the subscription, subscribing just adds another filter to My Channels. The Playlists tab is different than a user creating a playlist. The channel playlist allows a channel manager to group media by topic or time period (week 1, week 2, etc). The Playlist appear in the channel listing. Channel Playlists are covered in this article. Contributor: a channel member can add content and make comments. We recommend this as the default setting for channels. Moderator: a moderator can approve content held for moderation, and contribute content. Manager: a manager can add and remove content; edit the settings for the channel; and view analytics. Owner: there can only be one owner of a channel, this is the creator of the channel by default. What does the error "User does not exist" mean? If you see an error message that the user does not exist, it could mean one of two things. If the person has never logged into Illinois Media Space, you will receive this message. The person must login to Illinois Media Space at least once, in order for them to have an account in Illinois Media Space. For Illinois Media Space a user’s username is their netID (the part of their university email preceding the @ symbol). If a whole email address or a UIN is used, it will generate a “User does not exist” error. 1. Ask the user to log in to Media Space and add them later. 2. Contact the Kaltura admins. Include the url of the channel and the netids of anyone that you could not add.